Beings of pure malevolent energy. These creatures, these “Demons” have been feared, depicted as magical servants, villains in certain stories, heroes in spite of all odds in others. We are not interested in demons as in religious antagonist figures. Rather, the iconography that inspired artists forward to create beings of evil is what attracted us to this showcase. We will try to contextualize, and craft our own Demons from the Demons that spring forward from within the art of these amazing creators. Let us all enter… The Hellscape. At the gates of the Hellscape, sits Macacoaco. He protects the council that regulates Hellscape with his devilish mischief. Poking, probing, flinging flaming rocks, this Monkey-like creature with its deadly obnoxious antics will keep the lesser souls from entering the Hellscape. 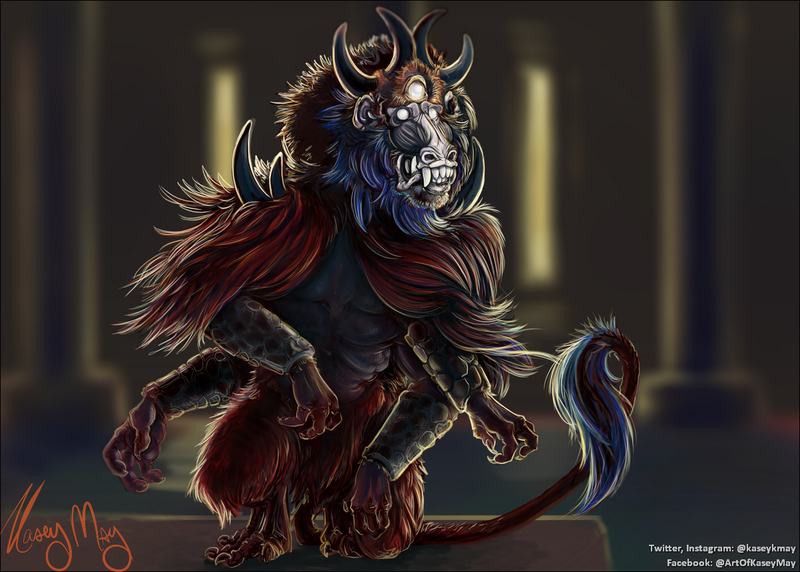 Magoto is one of the lesser demons around Hellscape. He is responsible for catering and care to the other Demon’s food habits. His favorite is to serve maggots, millions of the critters. His food is often poisoned, modified to weaken and flat out kill any who eats from his plates. However, due to the malevolent physiology of the higher ranking demons, all Magoto can do is keep his place in Hellscape safe from upstart creatures. For now, anyway. In the red forests of the Hellscape, a green monarch sits on a throne of skulls. ‘Kurth’ is the name whispered in the leaves as heat waves pass through the withered trees. It’s ambitions and personality are a mystery. For it feeds upon any who enters his domain. Kurth never leaves its sanctuary, apparently content with his lot in his spectral life. Lording over smaller imps and other pathetic creatures lies the warlike Deralik, the general of the army of darkness. His head consists of a massive mouth with razor-sharp teeth. He barks his orders, constantly. In fact, he can only talk in orders. His preferred way to communicate however consists in violence with melee weapons. A violent creature that lives in a violent hellscape. Banerinus is a vagrant of the hellscape. At one point, he was human, however, his stubbornness did not allow him to succumb to the malevolent beings of the hellscape. Rather, his selfishness and cruel sense of humor kept him alive enough to discover he could eat the demons he fought, absorbing their skills. His place in Hellscape is one Banerinus takes for himself, one bite at a time. Stalking through the Hellscape, the demon know as “Caentaurus” hunts for prey. Any creature that dares to step in his domain is marked for death. It considers the whole of Hellscape it’s hunting ground. Sitting at the top of the chain, lies a being with a name so ancient, it has been forgotten by time itself. This creature body extends towards the recesses of Hellscape, it’s beating heart shapes the land around. He is not only the lord of the Hellscape, he is the Hellscape itself.